“The Drug King” is not a flop by any means. On the contrary, it is probably one of the better South Korean films of the year. But when you have masterful Song Kang-ho as the protagonist, plus the brilliance of Bae Doo-na, Jo Jung-suk, Lee Sung-min and so many other talented actors and let it all go to waste, that just doesn’t cut it. Woo Min-ho’s upcoming crime drama about a 1970s drug lord is funny, visually impressive and well-acted by the always-dependable Song, but it suffers from a weak story, wasted plot points and a failure to use its great supporting cast. The film starts off in 1970s Busan with Lee Doo-sam -- Song -- a small-timer in a drug-smuggling ring looking to make ends meet for his wife and children, as well as his three sisters. After his boss sells him out and he does time in prison, he decides to expand his activities by extending his trade across the sea to Japan, associating with more dangerous people such as the yakuza. A life of crime has its perks, and Lee’s parade of bribes earns him various honors, not to mention connections with bigwigs and an affair with well-connected lobbyist Kim Jeong-ah, played by Bae Doo-na. But in the course of these adventures he is chased by hard-nosed prosecutor Kim In-gook -- Jo Jung-suk. The biggest and most obvious strength of the film is the lead. I’ve rarely seen Song strike out in a movie and “The Drug King” is no exception. He absolutely shines -- sometimes he’s funny, at other times menacing and complicated. Having said that, the rest of the cast is just wasted. If you know anything about Korean cinema, you know that Woo commanded a dream team cast. That’s hard to tell from the film, though. Bae is a talented actress, but her performance here is just ... dull. Her acting is unbelievably poor for a person who has received so many accolades, although I’m willing to give her the benefit of the doubt given her past work and the fact that her character was written poorly. Jo is another actor who can pull off both serious and funny -- but in this film, he is neither. In the “The Face Reader,” for example, the Jo-Song team had the audience rolling over one minute, then in tears the next. How do you make Jo this unimpressive? Lee Sung-min can carry a whole movie by himself, but here he contributes almost nothing. That’s excusable because he had so little screen time. Even so, Kim So-jin, Lee Hee-joon, Yoon Je-moon and Yoo Jae-myung are all excellent actors who just fade away. The film is visually impressive, though not stunning. The sight of Lee Doo-sam sitting alone behind a flamboyant desk is symbolic of his hollow ambitions. The costumes and scenery effectively convey the empty splendor that is the “drug king’s” empire. 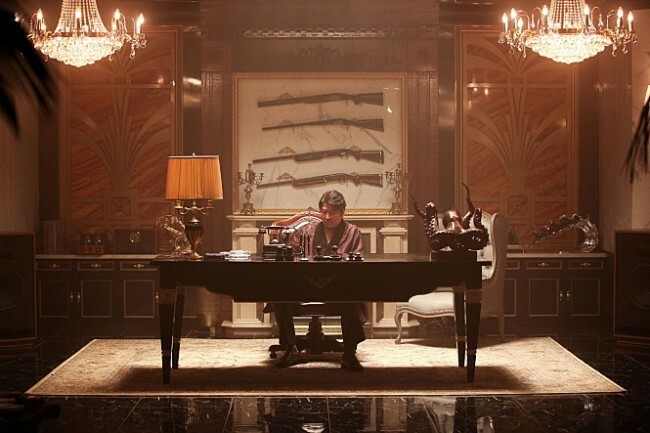 Lee’s desk is reminiscent of the image from “Scarface” from 1983. In fact, the parallels with the Hollywood classic starring the legendary Al Pacino keep popping up so frequently that it’s annoying. Whether this is intentional or not, the imagery, the characters, their lust, their rise and fall feel similar -- and cliche-ish. In fact, the movie at one point appears to be galloping toward a “Scarface” ending, and then just bail -- perhaps because the director realized it in the nick of time. I initially thought “The Drug King” would more closely resemble the 2012 Korean flick “Nameless Gangster: Rules of the Time,” a black comedy that was blacker and more comedic than this one. As a black comedy, “The Drug King” is pretty funny thanks to a wonderful performance by Song. His chemistry with Kim So-jin isn’t bad, but it’s not outstanding either. Overall, moments of really good chemistry between actors in this film are few and far between. For the most part, the chemistry is passable at best. Relationships between the characters tend to develop off camera, which is why scarcely anyone other than the protagonist gets any substantial character development. And while we’re talking about waste, many plot points go nowhere too. Lee’s family serves as a plot device, his bad blood with a government official who tortures him and creates an unwanted connection with a gangster doesn’t really pan out, and Kim In-gook’s pursuit of Lee doesn’t add that much drama. Perhaps my expectations were too great for the man who directed the poignant “Inside Men,” which looked at the corrupt networks among politicians, media and conglomerates. But while “Inside Men” had wit, powerful subject matter and an iconic line that struck the hearts of Korean moviegoers, its story too was somewhat forced. Its main strengths were great characters and great acting. Is “The Drug King” that god-awful a movie to deserve so much bashing? Absolutely not. It has some genuinely funny moments, and Song is as brilliant as ever. It is a film that is at least passable. But it should have been much, much more. When you have a beyond-awesome cast and an interesting (if somewhat overused) premise, this shouldn’t be the best that you can do. “The Drug King” opens in theaters Dec.19.